Wahoo! 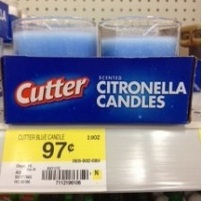 You can score free Cutter Citronella Candles at Walmart! NOTE: An ad prints after the coupon, so be prepared to cancel the print, or find another coupon to print out. I suggest the $1.25 off Glade Plugins Warmer Unit coupon. You'll be able to score one for just $0.13 at Walmart or free at Dollar General!